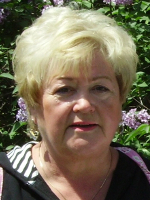 ALBANY – Katharina “Kate” Kappeller, 69, of Albany, passed away on Monday, June 25, 2018. Kate was born in Germany, but came to the U.S. in 1952, and was raised in Hudson. She moved to Albany as an adult, and was employed as a hairdresser by Rinaldi’s, the Hair Company, and was a partner in the Shampoo Salon. In recent years she operated her hairdressing business from her home. She enjoyed golf, and had been a member of the Western Turnpike Golf Club for over twenty years. Kate was predeceased by her parents Henry Kappeller and Elisabeth Bachmann Kappeller. She is survived by her brother Henry Kappeller (Kathie) of Red Hook; her sister Elisabeth Charette of Clifton Park; her niece Jennifer Kappeller (David Udoff); her nephews Chris Kappeller (Nicole), and Scott Kappeller (Patricia); and by four great nieces and two great nephews. Kate had a large circle of friends, who along with her family, are mourning her sudden passing. A memorial service will be held at Hans Funeral Home, 1088 Western Ave., Albany on Saturday, July 14, 2018, at 1:00 p.m. Relatives and friends are invited, and may call at the funeral home the same day beginning at 12:00 p.m. To leave a message of condolence for the family, or obtain directions to the funeral home, please visit www.HansFuneralHome.com . In lieu flowers please make a donation to the American Diabetes Association or the Mohawk Hudson Humane Society. So sorry for your loss she will be missed. Kate my friend my heart is hurting today I am feeling lost. You were not only my friend for many years but the best hairdresser EVER, not to mention such a great neighbor. I always admired your love for flowers , thr love you shared with Rosie and Lily your beloved cats and of course we can’t forget Daisy your sweet little companion of the last 10 years. I loved hearing about your trips to THOES tropical places with your friends. Even though you had your share of problems you always managed to smile through the pain. The tears are flowing as I am writing this . Rest in everlasting peace my friend , Rosie and Lily have been waiting patiently at Rainbow Bridge for you . I extend my sincerest condolences to Katie’s family at this very sad time. I will cherish all the fond memories that I have of Katie and all of the fun and crazy times we had playing golf together. She was such a beautiful person both inside and out. Her talented hands always made my hair look good for the past 20 years. Her beautiful smile and cheerful laugh will remain with me always. Katie’s classmates from Hudson High School, Class of 1966 were shocked and deeply saddened to hear of Katie’s passing. Many of us enjoyed bi monthly luncheons with her and throughly enjoyed her company and companionship. She was an outgoing, enthusiastic, memorable personality who’s departure will be difficult to accept. My deepest condolences to her family and friends. My heartfelt sympathy goes out to all of Katie’s family and friends. Working with Katie at the Hair Co. were some of the happiest years of my life.God Bless You Katie and rest in peace..